Covering 250 acres, the Gardens by the Bay are a principal element of Singapore's plans to move from being the Garden City to being a City in a Garden. The largest part, of 130 acres, is called Bay South Garden, designed by Grant Associates, of the UK and Singapore, and opened in 2012. The gardens promise much, but a visit to the free Singapore Botanic Gardens, and a 'local' trip to the Bicentennial Conservatory, within Adelaide's Botanic Garden, will delight much more - no tackiness in either. There are two giant cooled conservatories, the Flower Dome and the Cloud Forest, both designed by Wilkinson Eyre, of London. The former, 125 feet tall and covering three acres, is the largest column-free glasshouse in the world. The engineering is stunning, but the fantastic collection of plants from semi-arid regions is rather ruined by the welter of plastic and concrete tat that someone has seen fit to place amidst it. The Cloud Forest is smaller, at two acres, but taller, to accommodate the 138 feet tall 'Cloud Mountain', richly dressed with epiphytes and bromeliads, and from which drops a 115 feet tall waterfall. The biome emulates the cool, moist environment of tropical mountain regions. The effect is impressive, but behind the scenes, visible upon taking the lift to the top, the whole looks like nothing so much as a multi-storey car park. The suspended path, which gradually returns one to ground level, provides a great view of the planting, but the displays are spoiled by absurdities such as Lego pitcher plants. The relentless references to addressing climate change are rather undermined by the Brobdingnagian use of concrete and steel, and the worldwide shipping of millions of plant specimens. Of real note are the 18 steel Supertrees of the Gardens, a dozen of which form Supertrees Grove within Bay South Garden. Between 82 and 160 feet tall, and sheathed with tens of thousands of individual plants, these vent hot air, and cool circulating water, for the domes. The engineering was by Atelier One, the planting by Atelier Ten, both of the UK. The Singapore Flyer is the second tallest Ferris wheel in the world, with a wheel diameter of 492 feet and an overall height of 541 feet. (The tallest is the High Roller, in Las Vegas.) It was designed by Kisho-Kurokawa Architects & Associates, of Japan, and DP Architects, of Singapore. Arup were the structural engineers. It took just two-and-half-years to build, opening in 2008, at the incredible cost of about £90m. The main contractors were Tekenaka and Mitsubishi, both of Japan. Unusually, the wheel is constructed with a slim ladder truss rim. The standard design for modern Ferris wheels is a rim of triangular cross-section. The 'one-dimensional' truss makes for a largely unobstructed view. The rim weighs 700 tonnes, the cables 300 tonnes, and the supporting structure and spindle 600 tonnes. The whole is founded upon 38 piles, driven 130 feet into the ground. A full rotation takes about 32 minutes. The wheel originally rotated counter-clockwise. In August 2008 the direction was reversed on the advice of feng shui masters. They could have simply walked round the other side. The view is an ever-changing one of the architecture of Marina Bay and the city, the Gardens by the Bay, and the shipping beyond the Marina Barrage. The 28 capsules, which can each carry 28 passengers, are air-conditioned. Both factors make this a far better attraction than the nearby Marina Bay Sands Skypark observation deck, which latter provides no seating or shade. The National Orchid Garden is located within the Singapore Botanic Gardens. The latter dates to 1859 at its present site, was founded by an agri-horticultural society, and played a pivotal role in the development of Malaysia's agricultural economy. The former lies within the latter, but dates back to just October 1995. The orchid collection covers more than seven acres, spread across the highest hill in the gardens. The Garden is home to about 60,000 orchids - the largest collection in the world. The collection comprises about 1,200 separate species, plus about 2,000 hybrids. The Garden is at the leading edge of orchid studies and is a pioneer in the cultivation of hybrids, Singapore being a major exporter of cut orchids. The Garden is home to a very large display of Papilionanthe 'Miss Joaquim', the hybrid climbing orchid that in 1981 was adopted as the country's national flower. Singapore honours visiting heads of state and celebrities by naming hybrids for them, and the Garden includes a fine display of these. The Shangri-La, rightly named for the tranquil and beautiful lamasery of James Hilton's novel "Lost Horizon", is the flagship of the eponymous luxury hotel group. The hotel, what is now called the Tower Wing, opened in 1971. The Garden Wing (top and above), completed 1978, renovated 2011-12, is constructed around a luxuriant indoor garden, complete with waterfall and koi ponds, somewhat like a cross between a botanic garden and a set from Thunderbirds. The exclusive Valley Wing, opened 1985, completes the hotel. Here, the complimentary copy of "Lost Horizon" is twinned, at turndown, with a new themed bookmark each day. The 15 acres of gardens include The Orchid, a 23-feet-high steel and bent wood open-air orchid house, built in 2016 to celebrate the hotel's 45th anniversary. The seventh running of the show was held, for the second time, at Whittington Castle, the weather such this year as to enable the show vehicles to be ranged around the walls of the castle, along the line of what would once have been the moat. Over 120 vehicles were on display, making this the largest show to date. There were many new participants, including an impressive Jaguar XJS 6 litre V12 (top), a cute 1927 Lea-Francis K Type tourer (above), and a sparkling VW Karmann Ghia coupe of 1974 (below). Second prize went to Steve Willis' 1962 Saab 95 (below), a lovely example. James Allmark carried off the unique show winner's trophy, for his Morris Minor pickup of 1968, with its natty tarpaulin covering. An exciting new venue for 2020 promises an even bigger and better show, with some new attractions. Very nearly the holy grail. Four of Ekco's round radios of the 1930s and 1940s - not the AD75 - were available for special order in a variety of colours, the cabinet made of urea formaldehyde instead of the Bakelite used for the standard 'walnut' and black cases. As far as is known, there are three genuine colour A22s - two red and one 'onyx' green - and four genuine colour AD65s - three onyx green, and one ivory. All others are reproductions or fakes - Gerry Wells' wooden Wells Coated AD65s amongst the former, and a number of injection moulded A22s passed-off as genuine amongst the latter. The very best reproductions are those made by Graham Rowe, in Brisbane, Australia. Using moulds taken from genuine sets, the cabinets are made from a thermoset polymer, a compound of stone, plaster, resin and acrylic. The fakes can be melted, whilst Rowe's cabinets are irreversibly hardened, under heat and pressure. To date, he has made five AD65s - two onyx green, one swirled red, and two ivory - and four A22s - two red and two onyx green. The pictured set is one of Rowe's two onyx green AD65s. It has an original Ekco chassis, and an original Ekco station dial, replacing the reproduction one with which the cabinet was initially fitted. Naturally, the speaker cloth is modern, but a very close match to the original. The bars are made from polished aluminium. The back is from an original AD65, and replaces the original with which the cabinet was initially fitted, being in better condition. The moulding is absolutely correct, down to the ribbing inside, and the swirled colour is spot on. Even the captive screw retainers are correct - made of brass, moulded into the cabinet, and of the correct thread to accept the 2BA (British Association) cheese head screws used to affix the back. Were it not for the absence of the stress cracks in the cabinet which characterise all genuine colour round Ekcos, it would be impossible to tell this set from the real thing. 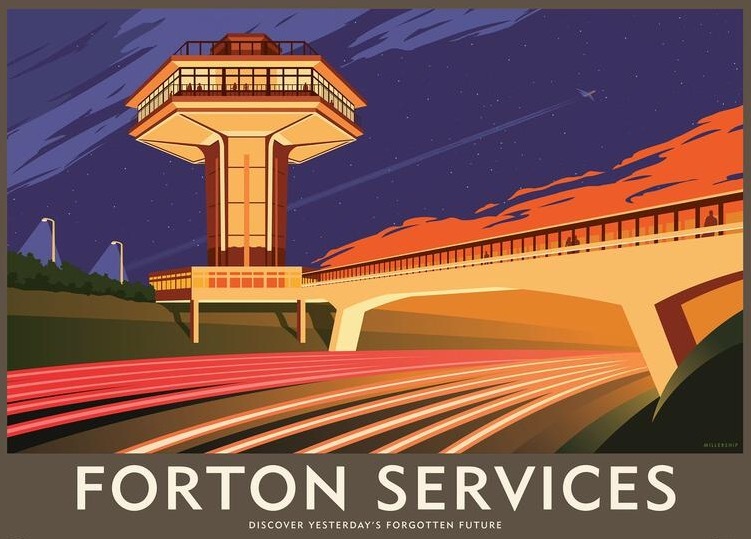 Forton Services, now called Lancaster Services, between junctions 32 and 33, was the second service station to be opened on the M6 motorway, in November 1965 - the first being Charnock Richard. It is famous for its concrete hexagonal Pennine Tower. In the cantilevered space, 74 feet across, was a restaurant and sun deck, looking out over Morecambe Bay and the Trough of Bowland. The site and tower were designed by T.P. Bennett and Son, responsible for much of the development of the new town of Crawley, West Sussex; and was originally operated by the Rank Organisation. The structure, which emulates an air traffic control tower, stands beside the northbound carriageway, with an enclosed bridge linking it to the southbound. The tower closed in 1989, as the restaurant deck lacks a secondary exit in the event of emergency. Despite Grade II listing in October 2012 it stands rather forlorn. Indeed, the whole site looks very worn. Thursday 4 March 1965 to Wednesday 4 February 2009. Photograph: Roseberry Topping, Cleveland Way, September 1992. Broadway Tower stands atop Beacon Hill, at 1,024 feet the second highest point in the Cotswolds. It was built as a 'Gothic' folly for Lady Coventry, wife of George William, the 6th Earl of Coventry, one of the great patrons of 18th-century estate landscaping. Completion was circa 1799. The tower formed part of an overall plan produced by Lancelot 'Capability' Brown. Brown recruited the architect James Wyatt, who was largely responsible for the design, Brown dying in 1784. Originally called Beacon Tower, the folly stands 65 feet tall. It comprises three storeys plus a rooftop terrace, from which it is possible to see 16 counties. The plan is an unusual one - a hexagon with round towers cut into three of the six angles. Sir George's son John gave away the tower in 1819 to the neighbouring estate of Middle Hill, then recently inherited by the bibliomaniac Sir Thomas Phillipps. Phillipps moved in his printing press in 1822, to establish the Middle Hill Press, but neglected the structure. The tower was abandoned in 1864 and remained empty until 1872. William Morris's friend Cormell Price leased it from 1876, and both Morris and Edward Burne-Jones frequented the tower as a retreat. It remained part of the Middle Hill estate until 1949, when it was offered to the National Trust as a gift, one which was declined. The tower was ultimately rescued by Anthony Wills, Baron Dulverton, who used his family's tobacco funds to restore it. With a second staircase inserted in another of the round towers, Broadway Tower opened to the public in 1975. Azulejos are Spanish and Portuguese ceramic tiles, painted and tin-glazed. The Museu Nacional do Azulejo, the National Tile Museum, in Lisbon, tells their history. In both repeating patterns, and pictorial panels, azulejos are found both inside and outside very many Portuguese churches, palaces, and public buildings, on walls, floors, and even ceilings. They are not just ornamental, but in some cases provide for temperature control within homes. Of Persian origin - azulejo is derived from the Arabic zellige, meaning polished stone - the form was introduced into the Iberian peninsula by the Moors. Manuel I introduced the tiles into Portugal following a visit to Seville in 1503. Following the Moorish tradition of horror vacui, the Portuguese often completely covered walls with faience azulejos, in a variety of colours. The blue-and-white tiles now synonymous with Portuguese architecture were introduced in the second half of the 17th century, from Delft, the Netherlands. YMGW reflects some personal interests. The hope is that you'll find something that interests you too. Followers, comments, corrections and observations are always welcome. © 2010-2019 ymgw.blogspot, in all photographs and content, unless otherwise stated. Use or duplication without express written permission from the site's author is strictly prohibited. "This was the first lesson I had learned about love. The day drags along, you make thousands of plans, you imagine every possible conversation, you promise to change your behaviour in certain ways - and you feel more and more anxious until your loved one arrives. But by then, you don't know what to say. The hours of waiting have been transformed into tension, the tension has become fear, and the fear makes you embarrassed about showing affection." Paulo Coelho, 1996, By the River Piedra I Sat Down and Wept.